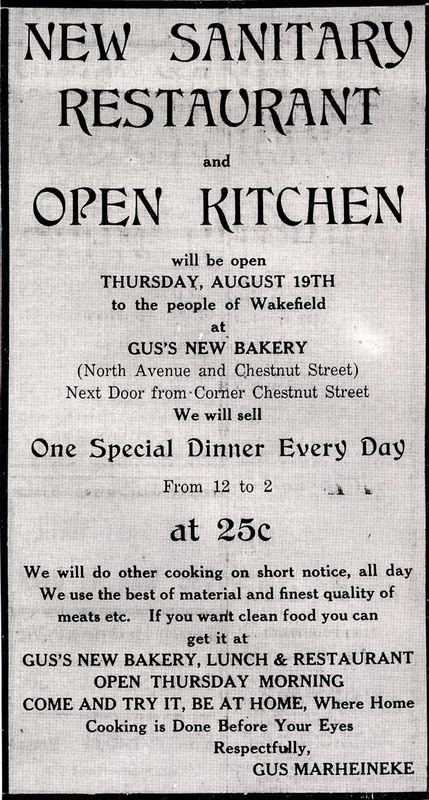 "Gus' Home Bakery and Wakefield Home Cooking Annex was located in the Walton Block on North Avenue in 1915. The appeal of clean, sanitary food came at the same time Wakefield children participated in a Hygienic Club." - Text from calendar by Jayne M. D'Donofrio. “Gus' Home Bakery, 1915,” NOBLE Digital Heritage, accessed April 20, 2019, https://digitalheritage.noblenet.org/noble/items/show/6967.